Keep your dog styling, while you let others know more about your dog, other than looks, with the EzyDog Convert Harness Custom Side Patches. Fits the Ezydog Convert Dog Harness. Dogs won't be misidentified with these custom patches on their EzyDog Convert Dog Harness. 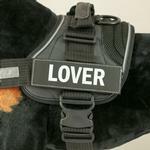 Customize the EzyDog Convert Harness with these unique removable side patches! Patches are sold in a set of 2. Harness sold separately.